The airborne EM (AEM) data were all acquired using the same/similar electromagnetic (EM) system on board a De Havilland Twin-Otter aircraft. The EM system is fully described by Leväniemi, et al. (2009). Flight line orientation was 345° relative to geographic north, in all the surveys considered here. Again in all the surveys, a nominal survey height of about 180’ (56 m) was subject to high-fly zones in relation to ground structures that were prescribed by the permitting procedure and by the clients. In broad terms, high-fly zones extending to 200 m and above, are associated with all conurbations of any significant size. Information on the 4 electromagnetic surveys, and additional commercial surveys (using the same EM system) is summarised in Table 1 and Figure 1. Figure 1 Outline polygons of the 3 surveys considered here. Tellus (TEL-05, TEL-06), Cavan (+Monaghan) CAV-06 and Tellus Border (TB-11-12). The polygon labelled C refers to the Conroy survey area reflown by TB-11-12. The two Tellus surveys, TEL-05 and TEL-06 extend ~1 to 2 km into the Republic of Ireland (ROI) and over the coastal zone of NI. The CAV survey provides no overlap with the Tellus surveys. The TB survey contains a zone of no-fly that corresponds to the CAV survey. The TB survey was designed to provide overlap zones with both the Tellus and CAV survey zones. The area labelled C corresponds to a commercial survey (Conroy) that was reflown by the TB survey. The data were acquired (by JAC) in 2006 as an extended component of the CAV survey. The availability of the Conroy data, for research purposes, allows for data comparisons using the more recently acquired TB data sets. The survey polygons are shown on 1 1:500k bedrock geology map with county outlines. The commercial OST survey, an extension to the main TB survey, is identified in green. 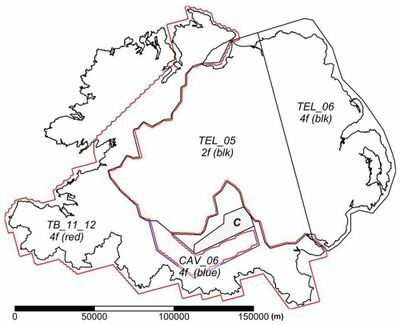 Figure 2 also identifies the coastal zones included in the Tellus and TB survey areas. 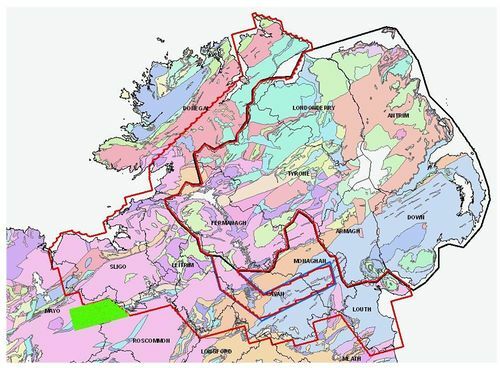 Figure 2 Survey outlines on base map of 1:500k bedrock geology and county outlines. Green zone is the commercial OST survey. The scope of the present study is to provide merged conductivity estimates for the survey data discussed above. This is undertaken using specific (half-space) conductivity estimates obtained at individual frequencies from the primary EM data (coupling ratios). No attempt is made here to consider the calibration and multi-frequency validity of these estimates. ↑ LEVÄNIEMI, H, BEAMISH, D, HAUTANIEMI, H, KURIMO, M, SUPPALA, I, VIRONMÄKI, J, CUSS, D, LAHTI, M, and TARTARAS, E. 2009. The JAC airborne EM system AEM-05. Journal of Applied Geophysics, 67, 219–233.